Charlie Gard died three days ago after his life support was withdrawn. He was a British infant born less than a year ago with infantile onset encephalomyopathic mitochondrial DNA depletion syndrome. There are three genetic subtypes listed on OMIM and I those linked in the Supplementary material below. Note that the capital letters in the titles is a convention of OMIM and not my addition. The medical details as well as the basis for the legal decision is available online. In this case the court sides with the Great Ormond Street Hospital in deciding to withdraw life support because of Charlie Gard's terminal medical condition. In the summary an American physician is mentioned who apparently suggested that nucleoside therapy might be tried even though it has never been tested for this condition in humans and it has never been tested in a mouse model of the human disease. The judge refers to the culture around these issues in the USA as being "slightly different" in that anything might be tried. This court document was apparently written before Charlie Gard was examined by the American physician Michio Hirano, MD who offered Nucleoside Bypass Therapy an experimental treatment for mitochondrial diseases. The parents of Charlie Gard ended their legal case to bring him to the United States for experimental treatment on July 24, 2017 - four days before he died. In the language of contested court cases - their attorney said that new tests confirmed that the experimental treatment would not help. In fact, there was no real evidence that the experimental treatment would have ever helped. The conflict between Charlie Gard's parents and the Hospital began after they successfully raised enough money to take him to the USA for treatment in January. The Hospital's argument at the time was that it was not in the best interests of their patient and subsequently that the treatment being offered was unlikely to be of benefit. The court documents describe their opinions included the opinion of an expert in mitochondrial diseases who had authored 140 scientific papers and book chapters. He is described as a person with grave neurological disease who is maintained by life support and the in the opinion of the Hospital staff the life support should be removed and he should be allowed to die. From a political standpoint, the right wing in the United States picked up on the case as a case of a socialist health service against the rights of the parents or as Brook Gladstone (On The Media) said: "a martyr to statist tyranny." On that same show, Melanie Phillips a conservative blogger and writer for the Times of London described the conservative commentators position in the US as "ignorant and ideological". She describes their writing about the case as something that could be used in the fight to repeal of Obamacare. She points out that conservative commentators in the UK are not invested in portraying the National Health Service as a killer. She points out that right to life activists and that agenda only exist in the US. It is part of a long succession of political rhetoric that suggests that the risk of a more openly government run system is that it puts the government between the patient and the doctor and the decisions are more likely to be consistent with what the state wants. "We should heed Charlie’s case as an example of gross government overreach and repeal IPAB immediately." Only the political right wing in America can draw such a connection. The rhetoric of the political right, is basically rhetoric that is thinly disguised as concern about individual rights. It requires a complete suspension of the current reality in health care. Those realities include the following. In Charlie Gard's case he was assessed and treated by experts from multiple specialities in the UK. No reasonable American physician would doubt that he received expert care and care that is probably available in a small minority of medical centers in the United States. There are two relevant concepts here - futile care and experimental treatment. In this case the best summary appears to be that there was really no evidence that the experimental care would do anything to alter the course of Charlie Gard's terminal neurological illness. There are striking inconsistencies in the positions offered by the political right. At the level of personal choice they make it seem like there is a panel that will be taking healthcare choices away from Americans. In fact, the panel will be addressing prices and cost containment. The political right also seems to have completely ignored how health care is rationed by health care companies and subject to racial and socioeconomic disparities. We are currently in the midst of a very inadequate system of mental health and addiction care based on 30 years of rationing by private American companies. If you are elderly and have a significant illness in an American hospital managed by an American company, you or your family is likely to be approached about the idea of palliative care or hospice care. It might be recommended that you forgo certain diagnostic tests or procedures because of your illness and transfer to a hospice setting. Nobody discusses the fact that these recommendations are aligned with the financial interest of the hospital. If you stay there too long or use too many resources - they lose money. This is the current system of care in the United States. As most people know - you don't have to worry about the government. You do have to worry about the the corporations making profits by charging you plenty of premiums and copays and deciding how they will not have to pay that out in services. That is the rationing that occurs millions of times a day in the US. 4. How is a market system that appoints private businesses as proxies for rationing services and that ignores the health of tens of millions of people ethical? As noted above - as millions of people are uncovered, tens of thousands die and more suffer. If your ethical priority is choice - these people do not have a choice. If your ethical priority is the sacred nature of life - these people have immediately been devalued. Unless I missed it - these seem to be the main ethical arguments of the political right. On the whole idea of the government getting between you and your doctor - there are currently two people standing between you and your doctor in the United States. The first is your health care company. The second is the company that manages your pharmacy benefits. If either of these companies does not want to act on your preferences or your doctors orders - they can make life miserable for both of you. The level of misery can extend from a flat denial of service or medication to saying that you don't meet their medical necessity criteria for a service. The only logical conclusion here is that American healthcare is highly flawed from an ethical perspective and right wing opinion clearly wants their constituents to believe that it is something that it is not. We are certainly technically competent to provide care. The political right has elaborate rhetoric to cover the flawed ethics and the balance tipped in favor of corporations rather than people. That keeps Americans from getting to the same level of performance as the other, less expensive systems in the world. That includes the National Health Service in the UK as evidenced by the life expectancy graph at the top of this post. 2: On The Media. July 27, 2017. WNYC studios - The Charlie Gard story is near the end of this podcast. 3: Lori Robertson. Dying from a lack of insurance. The Wire. September 24, 2009. Where Are All of the Pizza Shamers? On the drive home tonight I was listening to a radio piece about the new White House Press Secretary. Anthony Scaramucci, was apparently a banker and hedge fund manager before he accepted the new role. He was the head of SkyBridge Capital LLC and sought approval in January to sell this fund to a group of Chinese investors. He could make as much as $125 million off of the deal. The deal requires approval of the Committee on Foreign Investment in the United States (CFIUS) since it potentially involves national security issues. Another interesting aspect of this sale is that the President can apparently veto CFIUS decisions, although that has never happened in the past. Several commentators have discussed the role of White House Press Secretary as being a critical role in the administration. From an ethical standpoint, the relevant question is - should anyone with a pending large sale to a foreign power that is under review by an agency of the federal government be placed in such a position? Similar questions and others have been a constant consideration with President Trump and his administration. He has refused to distance himself from his businesses by placing them in a blind trust like previous members of the executive branch. That is the most glaring problem even though elected officials apparently get a pass relative to non-elected employees who have to adhere to Standards of Ethical Conduct for Employees of the Executive Branch. Additional criticisms include the foreign and domestic Emoluments Clauses, prohibiting elected officials from accepting gifts or making a profit from their elected position. Those criticisms have included hotel deals by foreign concerns in staying at the President's hotels or golf clubs and whether investments by government employee retirement funds in the President's businesses constitute violations of these clauses. An encyclopedic look at these potential conflicts of interest are included in reference 3 below. The only offsetting factor in terms of the potential to make money from some of these areas was an analysis in the Economist - suggesting that the President's business is mediocre and not very dynamic. That author thought that it would be several years before any profits could be realized due to these constraints. The lack of transparency for the President and the Executive Branch is stunning, but I think consistent with what could be expected from placing a businessman in the White House. Americans have general amnesia when it comes to the mistakes of history. Despite a Hollywood movie, most people forgot that in the financial sector engineered financial crisis of 2008, only one top banker went to jail and that was for concealing hundreds of millions of dollars in mortgage backed securities losses at Credit Suisse (5). The way around financial conflict of interest is to design a system where everyone's financial security is at risk all of the time and to let the investor know that absolutely nothing can be depended upon. Pages and pages of boilerplate illustrate this concept. Lose everything and it always comes down to your lack of due diligence, not the financial adviser who is selling you stock and shorting that stock at the same time. What do Americans expect will happen when they elect a President from that ethos? The standards for physicians are much different. Physicians can be reported to a database and listed on that database for accepting a meal worth as little as $10. In the heyday of drug representatives trying to convince physician to use their products the common currency was pizza. I used to see these reps dragging large boxes of pizza through the hospital where I worked usually to a Grand Rounds. People would pick up a piece of pizza and eat it during the noon presentation and then go back to work. Eventually arguments were made that even a single piece of pizza would bias a physician into prescribing a drug from the pharmaceutical representative who purchased that pizza. Examining the database of physicians who accepted payments shows that the vast majority on on the list because they were pizza eaters or they were listed for attending a company sponsored continuing education event. Research was presented to prove that pizza or an equivalent trivial reimbursement led to the expected pattern of prescribing. Psychiatrists were criticized far more than other physicians. I have posts on this blog that highlight the poor quality of these arguments and the associated research. Those posts include clear data that refutes the basis for pizza shaming and suggesting that there was something unique about psychiatry. The Institute of Medicine argument is that since it is hard to tell the difference between and appearance of conflict of interest from true conflict of interest - in the case of physician they must be considered the same thing. The IOM rationalizes their opinion as necessary to maintain public trust because of the traditional role of the physician. Coincidentally their opinion makes sanctioning bodies like the IOM and other organizations that purport to tell physician what to do and how to behave even more important and central to the medical profession. After all what would physicians possibly do without the IOM and other sanctioning bodies meting out these sacred opinions? The short answer of course is what they have been doing since sometime around the 4th or 5th century BCE and Hippocrates in Epidemics: "As to diseases, make a habit of two things—to help, or at least to do no harm." The writings are considered the foundation of the main elements of modern medical ethics. Rather than considering ancient history - ask the question - what is the the larger conflict of interest - a $5 piece of pizza provided by a pharmaceutical company or millions to hundreds of millions of dollars in trading profits? What is the appearance of conflict of interest versus actual conflict of interest in those two scenarios? In other words, if the party questioned denied they were influenced by a piece of pizza or a million dollars - who is the most likely to be lying? Keep in mind - the pizza is gone after you eat it. No matter how good it was the benefit is transient and overall trivial. Most people would not say that about a million dollars. Considering more realistic numbers for Congress rather than the Executive Branch, the average donation to a member of Congress from the pharmaceutical industry is $46,579 (averaged across members of both houses). What will have more impact, the money to a Congressman who is writing laws and regulations that govern the industry or a piece of pizza to a physician who may or may not write a prescription for that company's drug? That is assuming the Congressman is writing the law. There is plenty of evidence that the lobbyists either write it or directly influence it. You can't get that kind of influence with a slice of pizza. Taken at another level, the idea of physicians being so important in society that they must be held to a standard that few other citizens are makes sense in terms of individual health care. It does not hold at the level of society in general. It takes relatively few politicians to make decisions that affect the lives of tens of millions of people. Those decisions can result in mass casualties and result in generations of people living in armed conflict and poverty. Political decisions can result in large segments of society being actively discriminated against. Economic decisions can transfer wealth from citizens to favored industries at a large cost to individuals and their families. For all of these reasons - the idea that physicians should be reported for accepting pizza at a conference and members of the executive branch talking to potential business partners when they are supposed to be representing the best interests of the American people is more than absurd - it is an outrage. Where are all of the pizza shamers when they can really make a difference? Why aren't they focused where they should be? 1. Reuters. Scaramucci Awaits U.S. Approval for China Deal. July 21, 2017. 2. Adrienne Hill. Scaramucci's hedge fund sale to Chinese firm could pose a conflict of interest. Marketplace. July 27, 2017. 3. Jeremy Venook. Trump’s Interests vs. America’s, Pensions Edition. The Atlantic. July 27, 2017. 4. The Economist. Donald Trump’s conflicts of interest. November 26, 2016. (Contains an infographic of the Trump organization's estimated value). 5. Jesse Eisenger. Why Only One Top banker Went to Jail for the Financial Crisis. New York Times Magazine. April 30, 2014. 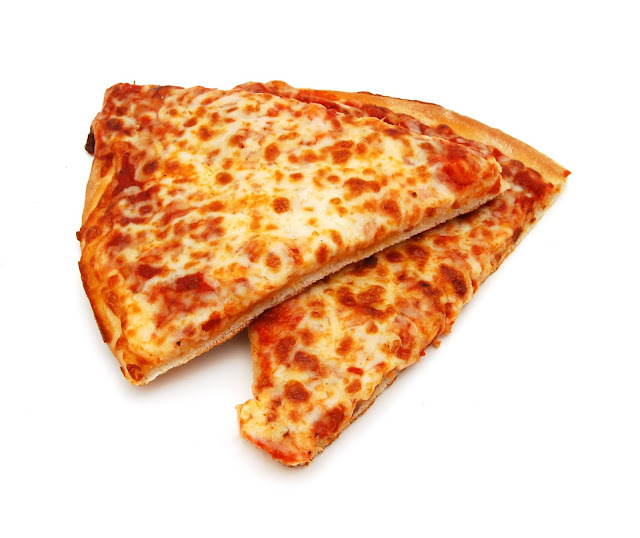 Pizza slices are from Shutterstock per their standard licensing agreement for non-commercial use. Stock photo ID: 122225896 Cheese Pizza with white background, close up - by Hong Vo. Accessed on 7/28/2017. From: Reference 1 with permission. "So I am in this old house. I have the feeling it is my Grandmother's house, but it is really a house I have never been in before. There is a gathering on the main floor and there are two people there. I know that one of them is supposed to be my grandmother but it doesn't look at all like her. There is a guy there who is apparently dating my grandmother. I know that he is supposed to be a handyman that my brother introduced to my Grandmother but I have never seen him either. They look like they are in their 70s. But in reality as you know - my grandmother has been dead for over 20 years." "Suddenly I am no longer at the party. I am in the house and I am in an upstairs bedroom. For some reason, I think it is my grandmother's bedroom. I don't know why I'm there but all of a sudden this guy comes down the hallway. He is one of the commentators from TMZ that Hollywood gossip show (let's call him Bob). I look to the floor next to the wall to my right and there are two small bowls of M&Ms - a bowl of green M&Ms closer to him and a bowl of red M&Ms closer to me. They are in those Anchor Hocking glass bowls without the blue plastic lids. Anyway - I grab a small handful and start eating them. They are dark chocolate M&Ms. I look at Bob and say: "That's what they're there for" and he starts eating a few." He asks why I am there and I say: "I heard there was a mouse in here and I need to kill it." "A mouse runs between me and Bob and I tell him to kill it. He misses it and it runs at me and I kick at it and knock it into the corner. Bob is still reluctant to kill it. The mouse runs at me again but this time it is as big as a rat. I kick it into the corner of the room again. This time it runs back out at me and it not longer looks like a rat - it is as big as an otter. I kick it again - but this time I am shaken awake by my wife. She asks me if I was having a bad dream. She said I was kicking my legs like I was running and punching my arms in the air for a few seconds. My heart was pounding like I was really in a fight with this thing. What was all of that? What does it mean?" There are a few things about this dream that are striking. The first is the amount of detail recalled right down to what appear to be the product placements. Most people telling me about their dreams rarely recall this level of detail. Often they recall only the emotional tone of the dream and the vague idea that something happened. The second is the overall content of the dream. By the dreamer's report it is illogical - none of the events really happened or are likely to happen. With the exception of the TV celebrity, none of the people in the dream were really who they were supposed to be. Strangers were supposed to be his grandmother and his grandmother's boyfriend but in reality - there was no such relationship. There is the movement. The dreamer is thrashing about the bed until his wife wakes him up. A final consideration that I like to think about is the processing power necessary to create this experience either de novo or from existing elements. Dream interpretation is still alive and well in psychiatry - at least the way I practice it. It is not quite the detailed analysis of all of the elements that Freud thought were important but a combination of a look at the predominate affects and what might be called a synthesis of what is supposed to happen in dreams. It is also not quite where we need it to be from a neuroscientific perspective. For example, for the most part we are still operating on a model that suggests more dream activity occurs in REM (rapid eye movement) sleep and that NREM (non-rapid eye movement) sleep contains very little. We know from dream studies that is not completely correct because both REM and NREM sleep have EEG correlates and we can wake research subjects up during dreams and determine if they are dreaming or not. Based on those studies there is a rough correlation - but there are still dreams occurring during NREM sleep and REM sleepers without dreams. Various theories have been advanced about why that occurs, but there is no comprehensive theory. The other issue is that dream content needs a better explanation. The simplified explanation is that illogical impossible dreams like the one described here are REM dreams and that NREM dreams are more like plausible events. Finally - movement during REM dreams is not possible suggesting that the dreamer in the above example was not in REM sleep or he has a neurological problem to account for the dissociation between his motor activity and the fact that he should be paralyzed in REM sleep. These thoughts about REM and NREM sleep are so pervasive in our society that I routinely interview patients who tell me why they think they are (or are not) getting enough "REM sleep". I was lucky to have found a recent paper (1) on the subject that if correct may prove to be a landmark study about the neural basis of dreaming and possibly consciousness. One of the advantages of this paper is that is it written from the perspective of consciousness researchers with an interest in the neural correlates of consciousness. In this study the authors ran three experiments looking at the question of dream reports and high density (256 channel) EEG. They used a serial wakening model in which subjects were awakened and asked to report if they were dreaming and could recall some of it (DE = dreaming experience) or if they experienced something but could not recall (DEWR=dreaming without recall of content). A third option was no experience of dreaming (NE = no experience). They were asked to characterize any content further according to protocol. There were two groups of research subjects. The first was a group of 32 subjects who underwent few awakenings - 233 total. The second was a smaller group of 7 subjects who had many (815) awakenings. In a third experiment 7 subjects were studied with 84 awakenings to see if the results of the first two experiments could be predicted. The initial section of the paper reports on the results of DE versus NE experience in the low frequency (1-4 Hz) power spectrum. The authors were able to identify what they describe as a posterior cortical hot zone (bilateral parieto-occipital area including the occipital lobe extending to the precuneus and posterior cingulate gyrus superiorly p. 873). DE occurred when there was decreased low frequency power in this region. That condition occurred in both REM and non-REM states. This finding across distinct sleep stages appears to be highly significant. The next section of the paper reports on DE versus NE in the high frequency power spectrum (20-50 Hz) that corresponds with high rates of neuronal firing. Some of the results are summarized in Figure 3 at the top of this post. In the DE experience condition increased high frequency power was noted in the same parieto-occipital regions that were associated with decreased low frequency power but it was more extensive. DE with recall of content was associated with more widespread extension of the high frequency map than DEWR (no recall of content). Additional observations were made of the high frequency maps with regard to specific recalled dream content. The results here are extremely interesting in terms of the specifics of content. The authors comment on the "perception versus thought" content of dreams. Some recalled content is an isolated thought or emotion and other content is very vivid imagery including full conversations like the example at the top of this post. In their experiments, the authors note that there appears to be an anterior -> posterior gradient for high frequency activity with thought content mapping out over frontal cortex and perceptual content mapping out over posterior cortical regions. They looked at dream content involving facial recognition and noted an increase in high frequency activity over the right fusiform gyrus - a structure noted to be involved in facial recognition during wakefulness. Dream content that involved spatial imagery was correlated with increased high-frequency activity in the right posterior parietal cortex and area with that expected function during wakefulness. Additional correlations were noted with movement and speech. In the final phase of the experiments, the authors sought to find out if the markers identified in the initial sections of the paper could be used to predict where or not a person was dreaming just based on their EEG data. They were able to accurately predict dreams 80.7 to 91.6% of the time (87% accurate across all states). I consider this to be a potentially critical paper to any psychiatrist interested in sleep or dreaming. If replicated it illustrates that there is a posterior cortical hot zone that correlates with dreaming across REM and NREM sleep stages. That in itself explains the lack of tight correlation of dreams with REM and NREM sleep. From a theoretical standpoint they point out the the low delta activity (1-4 Hz) that correlates with dreaming also corresponds to alternations in neuronal depolarization and hyperpolarization that causes a breakdown in cortical communication. High delta activity corresponds to states of diminished consciousness including some forms of delirium and loss of consciousness. They suggest that posterior cortical activation should be studied in patients with disorders of consciousness to see if there may be consciousness without responsiveness based on activity in this area. They also discuss the broader implications of dreaming as a model for the study of consciousness. That is a good point to end this post. I will continue to monitor the work of these authors and have been following some of them for some time. Dr. Tonini for example is probably one of the top experts (and theorists) on consciousness and the only psychiatrist who I am aware of who is doing this work. Figure 3 at the top used with permission from Nature Publishing Group - License Number 4154981341951. The figure is from reference 1. As I have previously posted - I have experience with standard array quantitative EEG (QEEG) and its limitations. I am a little skeptical of being able to determine the EEG spectrum in the fusiform gyrus by standard surface electrodes in what I imagine is a cap array. But time will tell. I am a child of the 1970s and I am still trying to figure out what happened back then. Most people think that the history has already written, but that is not what generally happens in the USA. The real history isn't typically written until after the major players are dead. Usually until they are dead for a long time. It was in that spirit that I watched a Netflix documentary about William Powell a few days ago. 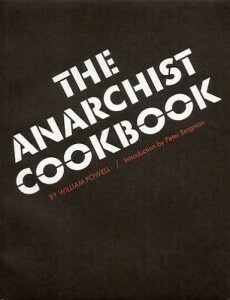 William Powell wrote The Anarchist Cookbook in the 1970s when he was 19 years old. In the documentary that single act was a thorn in his side for practically all of his adult life. The documentary is set in the home of Powell and his wife Ochan Powell. Ochan participated in the interviews. They were living in France and Powell had no inclination to return to the USA but his wife did. The interviewer asks Powell about his early life, the writing of the book, how his authorship had plagues him at times in his life, his knowledge about how it had been used and whether or not he had any regrets. Powell is introspective to a fault. In many cases it is clear that he is trying to find the correct words and I think it is natural to speculate about whether or not he is being defensive. He is confronted by the interviewer who is asking him tough questions about widely known incidents like terrorism and school shootings where someone happened to find a copy of the Cookbook in possession of the perpetrator(s). The New York Times obituary is a summary of the Netflix documentary. Please read that to determine if you want to see the film. I will focus on a few points in it that were under emphasized. The depiction of his early life, emphasizes a pathway to alienation. A Long Island born boy goes to England due to his father's occupation where he is viewed as an outsider. The family then returns to the US where he is viewed again as an outsider and mocked for having a British accent. He is sent to boarding school where he is molested by a teacher and at that point leaves and goes to New York City where he decides to write the Cookbook. In journalistic (and documentary) style these conditions are all presented as sufficient for him to write this document. I think an argument can easily be made that a large number of boys and men are alienated from society for various reasons and they eventually find a way to join the rest of the herd. I would not find it too surprising that at some level it is related to brain maturation processes that we now know extend into the 20s. There is another group of boys and men who are fascinated with weapons and explosives. The vast majority of these boys are not dangerous in any way to other people. Some of them are dangerous to themselves and end up getting killed or disabled by some of their experiments with explosives or setting up explosions. Powell's description of how he wrote the Cookbook, by going to a public library and sitting in the military section that contained all of the material he needed is totally plausible. I have some of these very books in my library and they were purchased off of Amazon. As early as elementary school, I was being taught to use the Encyclopedia to write reports and a good deal of technical information was available in those general volumes. You could find the general recipes for gunpowder, nitroglycerin, and even a detailed drawing of the inner workings of an atomic bomb. All of this material was openly available in 1960s Encyclopedias. Powell makes this argument a couple of times in the documentary as well as the disclaimer in the Cookbook that what he is presenting is general information. At no point does he or the interviewer touch on the notion that putting generally available information into the political context of anarchism and revolution, although the interviewer does consistently push for some level of accountability. At some point in his early life Powell found a calling - teaching emotionally and developmentally delayed children and teaching teachers about how to engage those children. There seemed to be a brief thread about how some of the school shooters may have had these problems. In the course of his career he was boycotted for various positions when parents discovered that he had written the Cookbook. He described a scenario where there was some initial concern and he e-mailed every parent to let them know that he had written the manual and was willing to answer any questions about it. They did not have any additional questions. During some of the interviews, his wife commented that he went through difficult times because of his association with the Cookbook. Like most documentaries, editorial license is involved. In the final shot Powell is asked a questions about some of the parallels between his life and some of the alienated people who read his book. The scene fades at that point and we never hear his response. I am sure that he had one. The final announcement was that he died unexpectedly on July 11, 2016. The central point of the documentary from the interviewer's standpoint was the effect that knowing the book was found in the possession of some infamous perpetrators of violence had on him and whether he felt he had any responsibility. He was very clear that he was responsible for writing the book but not how people used it. He acknowledged that he did feel badly about these associations and it did cause him to try to take action to get it removed from print. On Amazon, he has published a detailed letter about how he came to write the book and the fact that he no longer believes that violence is an acceptable way to cause political change. He refers to it as a "misguided and potentially dangerous publication which should be taken out of print" after discussing how he attempted to get his original publisher to take it out of print. He also wrote a detailed letter to the Guardian on December 13, 2013 that was apologetic requested that the book go out of print and that is available on their web site. In the end I was left with the impression that William Powell had done something that he regretted at age 19 and spent the rest of his life trying to make up for it. Unlike those of us who made similar mistakes, he was able to find a publisher that resulted in his big mistake being put into print. If I look back on those times, revolutionary rhetoric was commonplace and only rarely acted upon. Rebellious youth found no level of public support for a wide scale revolt. Most Americans then as now just want to put in a day of work and go home to their families. The other interesting aspect of trying to hold an adult man far removed from his rebellious teenage years accountable for that person is that it is developmentally incorrect. At a wider philosophical level, much more dangerous information is now available both in books and over the Internet. Anyone still reading the Anarchist Cookbook has not done much research. For me the developmental questions always linger. Why the fascination with explosives and violence? It seems to be an area that is consistently ignored. 2: Richard Sandomir. William Powell "Anarchist Cookbook" Writer Dies at 66. New York Times March 29, 2017. The pharmacoepidemiology of opioids in the United States depends on a fragmented approach. 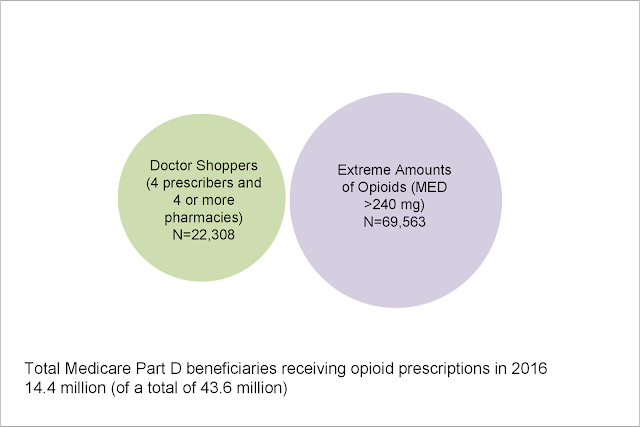 I recently posted a CDC study that used a commercial pharmacy database to look at the characteristics of opioid prescribing across individual counties in the United States. In the past week I came across this data brief from the Office of Inspector General (OIG) of the US Department of Health & Human Services. Their database is the 43.6 million beneficiaries of Medicare Part D. Their stated goals are to protect beneficiaries and the community from prescription drug abuse, to prevent diversion and illegal sales, and to protect the program from fraud and unnecessary expense. In addiction practice these are common doses encountered in the low range of prescription opioid use disorders. I used the brand names for hydrocodone and oxycodone preparations here because that is what people commonly report to me and it typically requires more investigation. For example "Percocet" or "Perc30s" commonly refers to higher dose oxycodone without acetaminophen - a single 30 mg tablet of oxycodone or 45 MME. The authors of this brief do not need to be concerned about those data discrepancies because they are able to get specific claims data. In terms of outcome data, they looked at all of the prescriptions and cost variables as well. They looked at total exposure. 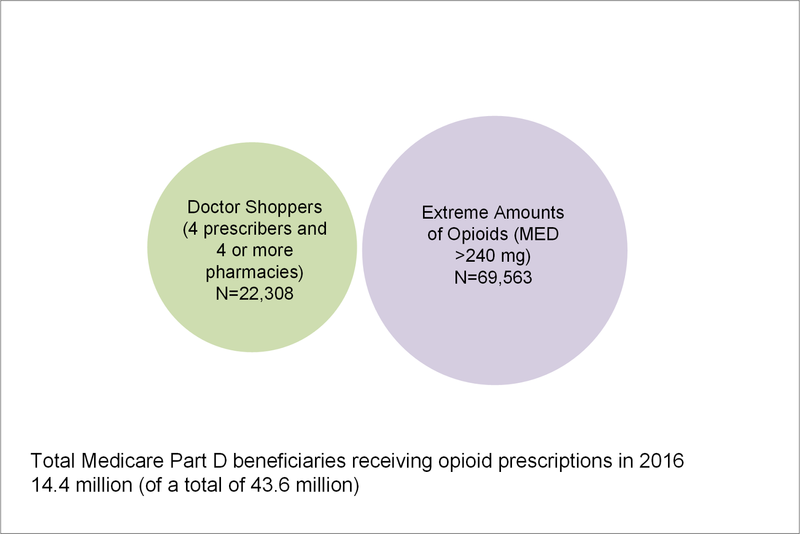 One in three Medicare Part D beneficiaries received at least one opioid prescription. That amounts to 14.4 million people out of a 2016 beneficiary base of 43.6 million people. There were a total of 28.2 million hydrocodone-acetaminophen prescriptions, 5 million oxycodone-acetaminophen prescriptions and 14.8 million tramadol prescriptions. Tramadol is not typically included in opioid studies even though the M1 metabolite is a mu receptor agonist. Tramadol is a prodrug metabolized by CYP2D6, metbolism is necessary to to create M1 and slow metabolizer are less likely to experience the analgesic effect and addiction risk. Of these beneficiaries 501,008 received high dose opioids (MED > 120 mg/day). The indication here was for noncancer or chronic noncancer pain. Hospice patients and cancer patients were excluded. The most common opioid prescribed in this high dose group was oxycodone 30 mg. The study also defined extreme amounts of opioids as an MED of 240 mg and 69,563 patients received that amount. There were 678 patients receiving high extreme amounts a MED of 1,000 mg for an entire year. The concern with very high levels is whether the prescriptions are indicated and whether they might be diverted. The authors also suggested that fraud could be an issue due to stolen Medicare identification number. They did give an example of a patient who got 62 opioid prescriptions on one year (61 from the same family physician) with an average daily MED of 3,130 mg. The brief also estimates the degree of doctor shopping or seeking prescriptions from more than one physician and pharmacy. The criteria used for this report was 4 prescribers and 4 pharmacies. A total of 22,308 beneficiaries met that criteria and they also had an average daily MED > 120 mg for a period of three months. They also identified 162 beneficiaries who got opioid prescriptions from 10 different prescribers and 10 different prescribers in the same time period. Even larger number of prescribers and pharmacies were noted in the most extreme cases. That number represents about 0.02% of the total number of beneficiaries using opioids and that is the same order of magnitude of a previous estimate from a large commercial prescription database (4). Using the estimates of high dose opioids and degree of doctor shopping allowed for an estimate of serious risk of opioid overuse or overdose. The number estimate in that category was 89,843 or about 0.6% of the entire group taking opioids. The brief also looks at the issue of who is prescribing the opioids. For the 89,843 there were an estimated 115,851 prescribers who wrote at least one of those prescriptions. A total of 401 prescribers were determined to be "far outside the norm". One hundred and ninety eight ordered opioids for patients getting extreme amounts of opioids (MED of 240 mg), 264 ordered opioids for patients who appeared to be doctor shopping, and 61 ordered opioids for patients who were members of both groups. The total number of prescriptions written by prescribers in this group was 256,260 opioid prescriptions. There were 15 prescribers who ordered opioids for > 98 beneficiaries receiving extreme amounts (MED of 240 mg). Of the 401 prescribers with questionable prescribing 1/3 or 133 were nurse practitioners (N=81) or physicians assistants (N=52). 1. Opioids are commonly prescribed to Medicare recipients - and the vast number of these prescriptions appear to be appropriately managed. 2. A small number of prescribers appear to be responsible for most of the inappropriate prescriptions - and there are some outliers practicing at the extremes in terms of prescribing patterns. Very extreme prescribing described in a few cases would appear to be a function of unnecessary use rather than patients with special needs who require extremely high doses of opioids (MED > 375 mg). That is an important point because concentrations of high dose opioid prescribing is often attributed to the special needs of patients or referral patterns resulting in concentrations of these patients and the need for the prescriber to write prescriptions for these amounts. If this was a case of biological variability - a much larger fraction of the patients who require extreme amounts of opioids. 3. The problem of inappropriate prescriber appears to be easy to follow on the CMS data base - the standard political approach to the opioid epidemic is to blame all doctors and mandate various education programs about opioid prescribing. It should be clear that a minority of physicians or in this case prescribers are problem and there should be a targeted approach. At the very minimum the prescribers in the top 1% of all prescribers or the group who is prescribing extreme amounts of opioids, to people who are probably doctor shopping, or both should be receiving active feedback from CMS. 4. Not counting opioids prescribed for cancer or hospice care is an important omission - This is a problem with very little research or policy making. Patients undergoing end-of-life care are prescribed liberal amounts of opioids for pain relief. There is no question that these patients should have adequate pain relief by whatever medication is necessary. The question is what happens when there are opioids from these prescriptions that the patient never uses? One palliative care study (3) noted that of the hospice care agencies responding to their poll, over a third noted that substance use and diversion were a problem for their agency. Diversion of drugs is known to occur in health care systems where there is monitoring and checks and balances. There are large amounts of opioids out in in-home hospice care settings with much less accountability. A similar study looking at the amounts of opioids prescribed in these settings and what happens to that medication is needed. 5. Opioids are not prescribed in isolation - CMS and the OIG are not medical research organizations. A more comprehensive approach to the problem would look at all of the medications that these patients are receiving and not opioids in isolation. Benzodiazepines frequently accompany opioid prescriptions and in some cases with sedative hypnotics for sleep. Prescribing both compounds can lead to serious and in some cases fatal drug interactions. That would result in an additional category of inappropriate prescribing of opioids. Although this is an administrative database, it does illustrate how this data can be used for pharmacosurveillance purposes. There was emphasis about the cost of opioid prescribing and the need to prevent fraud from a CMS perspective. The data could also be used to provide valuable feedback to physicians and other prescribers as well as politicians and regulators. It can be used to counter some myths that seem to exist on both sides. 1: US Department of Health and Human Services: Office of the Inspector General. Opioids in Medicare Part D: Concerns about Extreme Use and Questionable Prescribing. HHS OIG Data Brief OEI-02-17-00250. 4: McDonald DC, Carlson KE. Estimating the prevalence of opioid diversion by"doctor shoppers" in the United States. PLoS One. 2013 Jul 17;8(7):e69241. doi: 10.1371/journal.pone.0069241. Print 2013. PubMed PMID: 23874923. The CDC continues to do outstanding work in providing useful metrics for monitoring the current opioid epidemic. The latest edition of the Morbidity and Mortality Weekly Report is no exception. In this analysis the authors look at a database representing 88% of the opioid prescriptions through retail pharmacies in the USA over the period 2006 to 2015. Buprenorphine products used for medication assisted treatment of opioid use disorder and other preparations containing opioids for non- pain treatment like cough syrups were not included in the total amounts. They calculated various metrics of interest from the data including the milligram morphine equivalent (MME) per capita and prescribing rates (per 100 persons) for overall rates, high dose rates, and prescribing rates by days of supply given (<30 days or ≥ 30 days). They also looked at county by county rates over the time period studied. Before I look at the result, I will digress a bit on the MME measure. There are standard conversion charts like this one used by the CDC that allows for conversion of a standard dose of an opioid into a MME. A few examples will illustrate the utility of this conversion. Suppose a person is prescribed oxycodone and acetaminophen tablets. Most of them contain 5 mg oxycodone + 300 mg acetaminophen. If the prescription says to take one tablet 4 times a day of needed for pain that is 20 mg oxycodone total or 20 mg x 1.5 (conversion factor) = 35 MME. Using the same example for hydrocodone (5 mg hydrocodone + 300 mg acetaminophen) yields 20 mg x 1 (conversion factor) = 20 MME. That means that roughly either of these prescriptions taken for one month, once a year gets to the per capita MME of 640. In addiction practice it is common to see people who are taking 120 to 240 mg/day of oxycodone per day. Doing the conversions yields a range of 180-360 MME. There is no good conversion from heroin to MME due to varied methodologies of use and very short half-life. With methadone the problem is long half-life and tolerance leading the conversion table to yield higher conversion factors at higher dose. With the calculations it was observed that the MME per capita peaked in 2010 at 782 MME and then decreased to 640 MME per capita in 2015. Both numbers are significantly higher than the MME per capita in the US in 1999 when it was 180 MME. Additional graphics of the other metrics from this article can be found in the tables below. A scan of the above graphics starting from the top left shows that the rate of opioid prescribing including high dose prescribing (> 90 MME/day) has decreased beginning in about 2010. The rate by number of days supply has increased slightly as has the number of days supply per prescription. The overall MME per prescription has decreased. The authors quote studies that show that patients are at risk for continued opioid use if they take them for more than 5 days and that once a person has been taking opioids for 90 days they are not likely to discontinue them. There is also the CDC infographic of prescription opioids as a gateway drug. People addicted to prescription painkillers are 40 times more likely to be addicted to heroin. In the county by county assessment there were more decreased in overall prescribing rate (46.5%) and MME per prescription (49.6%) than stable or increased rates. The high dose prescribing rates dropped the most (86.5%). It is likely that guidelines describing the higher risk of high dose therapy affect these rates than the recognition of opioid use disorders in chronic pain patients. There was a significant increase in the average day per prescription in the county by county analysis (73.5%). The authors also looked at a complex stepwise multivariable linear regression looking at numerous demographic variables and concluded that several variables accounted for higher amounts of opioids being prescribed including ( lower educational attainment, higher unemployment, more physicians and dentists per capita, higher prevalence of conditions associated with chronic pain (diabetes mellitus, arthritis, disability), higher suicide rates, and higher rates of uninsured and Medicaid enrollment. These variables accounted for 32% of the opioids prescribed at the country level. The study has the expected limitations of a large retrospective database study. There are signs that that physician education and some regulatory action may be having an influence in opioid prescribing. Any reduction in the populations exposure to opioids would be expected to have some impact, but as of 2015 there were an estimated 2 million prescription opioid addicts (2). The recent transition from prescription opioids to heroin and some street products containing fentanyl and carfentanil has been responsible for an increase in opioid overdoses despite the change in prescribing patterns. Although the total opioid MME per capita has decreased it is still about 3 times higher than it was in 1999 - the year before the current epidemics inflection point. Proponents of liberal opioid prescribing might say (and have said) that the prescribing of opioids for chronic noncancer pain in the years leading up to 1999 was too stringent and deprived patients of needed pain relief. My experience with addiction suggests otherwise. The risks of addiction with opioids is great. A current underemphasized area is primary prevention or not exposing young adults to opioids. The take home message from this paper is that secondary prevention may have an impact but at this point it is not clear cut. One thing is certain and that is the CDC does great work getting this data out and freely available to all interested physicians and patients in the world. It will be a solid record of how the opioid epidemic evolved and hopefully at some point - resolved. 1: Guy GP Jr, Zhang K, Bohm MK, Losby J, Lewis B, Young R, Murphy LB, Dowell D.Vital Signs: Changes in Opioid Prescribing in the United States, 2006-2015. MMWR Morb Mortal Wkly Rep. 2017 Jul 7;66(26):697-704. doi: 10.15585/mmwr.mm6626a4. PubMed PMID: 28683056. Attribution: Both of the graphics in this post are from reference 1 above. Both are used per the user agreement for the MMWR that states this information is in the public domain. This month's Journal of Clinical Psychiatry has a lead article about medication guidelines for adults with major depressive disorder. Is is an apparent function of the Florida Medicaid Drug Therapy Management Program For Behavioral Health. It is hard to imagine a title with more inappropriate terms for what psychiatrists do with medications. At least until I read the title of the article: "Florida Best Practice Psychotherapeutic Medication Guidelines (FPG) for Adults with Major Depressive Disorder." Here is a little insight into what I have difficulty with. Treatment with medications is not psychotherapy. Psychotherapy almost always needs to accompany medication treatment at one level of intensity or another. But providing medication alone is not psychotherapy. That is an important distinction because one of the common misconceptions is that a medication will solve common life problems like interpersonal problems at work or home and it will not. The second issue is the idea of medication "management". As one of my colleagues used to say: "Pharmacists manage medications we treat patients". The term should also be anathema to any psychiatrist who was around when billing and coding guidelines were invented. The term came to mean 10-15 minute appointment that reduced psychiatric treatment to a brief discussion of a medication. They were two of the lowest reimbursement codes in the coding scheme and they handily allowed psychiatric treatment to be split off from the rest of medicine and reimbursed at a lower rate. And finally the term behavioral health. This is a long standing business term to indicate a managed care environment with business supervision rather than a mental health environment with psychiatric supervision. All of these terms suggest that managed care companies and the government have more to do with these guidelines than psychiatrists. Sure enough, looking at the partners for this project the majority are behavioral health organizations or managed care companies followed closely by government organizations, other associations, and three psychiatry departments out of 24 organizations. The article itself describes the process as being the result of a multistakeholder Florida Expert Panel. The stakeholder word always makes me cringe. Whenever I have seen it in medicine and psychiatry nothing good has ever come of it. There are only two stakeholders in medical treatment - the physicians and the patient. I can stretch that to the family if they are still actively involved. I don't want to see anybody else in the room. "Notwithstanding the public health priority of MDD, as well as increasing public, academic. and policy attention given to MDD, misdiagnosis or delayed diagnosis and failure to incorporate appropriate measurement based care are significant modifiable deficiencies in current practice." If only that were true. In a state where there is widespread PHQ-9 screening. the screening tool suddenly becomes the diagnosis. Measurement based care suddenly becomes the collection of meaningless cross sectional scores from clinics all over the state listing a diagnosis of MDD. If only real life worked like intensive clinical trials out to prove a hypothesis. They go on to list several other reason for their guideline. They cite the American Psychiatric Association (APA) guideline as a "conflation" of empirical evidence and expert consensus - suggesting that nothing is sacred about expert consensus and that the patients seen by experts may not be the same as patients seen by other physicians. They suggest that guidelines derived from pharmacological trials may be limited by suggesting that they may have limited generalizability due to trail designs and conditions that rule out certain conditions, but don't discuss other problems in experimental design. They discuss limited long term follow up and measurement of functional capacity as a limiting factors. Given that the authors don't really intend to correct any of these criticisms it is difficult to see that as a rationale for the new guideline. Instead they say that their consensus process was their overarching principle in writing the FPG along with providing guidance (especially to primary care physicians) to provide safe and effective treatment for depression. The authors use a hierarchical approach to tiers of treatment without using an algorithm. Level 1 is initial treatment and Levels 2, 3, and 4 are basically used if the initial levels of treatment are ineffective or not tolerated. There are few surprises for any psychiatrist who is used to treating depression, especially referrals from primary care physicians. Given the stated concerns about the biasing effects of clinical trials sponsored by pharmaceutical companies for specific FDA indications, there were not many qualifiers about the addition of an "atypical antipsychotic approved for major depressive disorder (ie. aripriprazole, brexpiprazole)" at Level 2. Level 2 is basically a failure of Level 1 antidepressant monotherapy. In fairness switching to another antidepressant monotherapy at Level 2 is a suggested option. The clear concern that the authors have about second generation antipsychotics in their scheme is metabolic rather than neurological side effects. I have found a significant number of neurological side effects from aripiprazole including Parkinson's syndrome, akathisia. and tardive dyskinesia from these medications. Nowhere in the paper are the diagnostic skills listed as important for the physicians. In the emphasis about measurement based care there are no rating scales for drug induced neurological disorders. The question of safer augmentation strategies are not discussed. With regard to the issue of weight gain as a medication side effect, a strategy listed is "select medications that have a low relative risk of weight gain and metabolic syndrome". A couple of related issues come up including the fact that a significant number of patients walk into the clinic with high BMI, but they are there for the treatment of depression. Should the diagnosis of obesity and/or metabolic syndrome be made and managed along with the depression? What about the patients who gain significant weight on either aripiprazole or brexpiprazole? They definitely exist. What about clinicians who have developed successful strategies for using atypical antipsychotics with minimal to no weight gain? There are also the very common problems of insomnia associated with depression that does not resolve with antidepressant therapy and significant anxiety with or without panic attacks. Major depression with psychotic features and major depression with mixed features were discussed as important variants and special interventions not commonly used in primary care were included like electroconvulsive therapy (ECT) or transcranial magnetic stimulation (TMS). It was acknowledged that lack of patient acceptance and availability of these treatments might result in using various medication combinations that may be less effective. Vagal nerve stimulation was recommended as a level 4 treatment and I have serious reservations about that being effective for anyone. All in all the FPG is what I would expect from a collection of stakeholders, some of whom were listed as representatives of managed care companies. Rather than have these stakeholders rehash strategies that have been around for 20 years, there was an opportunity to design a comprehensive system of care for patients with depression and there is no evidence that has happened. There is a reason why people don't go in to psychiatry and some of those reasons don't bode well for the assumption that everyone in the system will now be doing comprehensive assessments like psychiatrists. A system of mental health care designed by stakeholders could possibly develop state- of-the-art resources for neuromodulation (TMS, ECT, deep brain stimulation), sleep studies, monitoring the cognitive effects of depression and antidepressants, detoxification and addiction treatment, and reasonable inpatient and residential resources. That same system would have designed in timely assessments of difficult problems like MDD with psychosis by psychiatrists. Adequate numbers of psychotherapists or pilot programs looking at computerized cognitive behavior therapy for sleep, depression, and anxiety would be more useful that one or two crisis oriented sessions with no specific orientation. A blanket statement about the utility of evidence-based psychotherapies without adequate numbers of therapists to carry it out is not helpful in any way. We need system redesign by stakeholders, not stakeholders making more guidelines while pretending that they know something about quality. -sophisticated electronic health records that are set up more for administrative than clinical purposes. They may have an obligation to design the system to optimize care rather than telling the people delivering the care what they can do in a poorly integrated system of rationed resources by applying strategies that are already well known. 1: McIntyre RS, Suppes T, Tandon R, Ostacher MJ, . 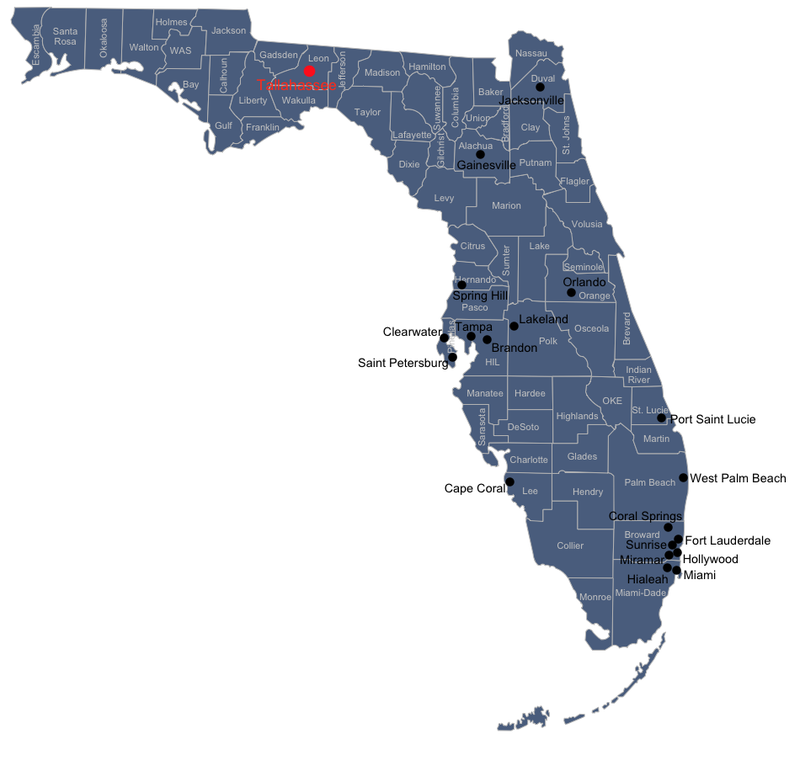 Florida Best Practice Psychotherapeutic Medication Guidelines for Adults With Major Depressive Disorder. J Clin Psychiatry. 2017 Jul;78(6): 703-713. 2: Ostacher MJ, Tandon R, Suppes T. Florida Best Practice Psychotherapeutic Medication Guidelines for Adults With Bipolar Disorder: A Novel, Practical, Patient-Centered Guide for Clinicians. J Clin Psychiatry. 2016 Jul;77(7):920-6. doi: 10.4088/JCP.15cs09841. PubMed PMID: 26580001. 3: Gartlehner G, Gaynes BN, Amick HR, Asher GN, Morgan LC, Coker-Schwimmer E, et al. Comparative Benefits and Harms of Antidepressant, Psychological, Complementary, and Exercise Treatments for Major Depression: An Evidence Report for a Clinical Practice Guideline From the American College of Physicians. Ann Intern Med. 2016;164:331-341. doi: 10.7326/M15-1813. 4: Qaseem A, Barry MJ, Kansagara D, for the Clinical Guidelines Committee of the American College of Physicians. Nonpharmacologic Versus Pharmacologic Treatment of Adult Patients With Major Depressive Disorder: A Clinical Practice Guideline From the American College of Physicians. Ann Intern Med. 2016;164:350-359. doi: 10.7326/M15-2570. I went back in today for a one week follow up of laser surgery for a retinal tear. An acute problem always brings some issues into focus so I thought I would continue on about some comparisons of psychiatry with modern medical technology as well as some of the differences that cast some advantage to psychiatrists. As usual there are always political implications. 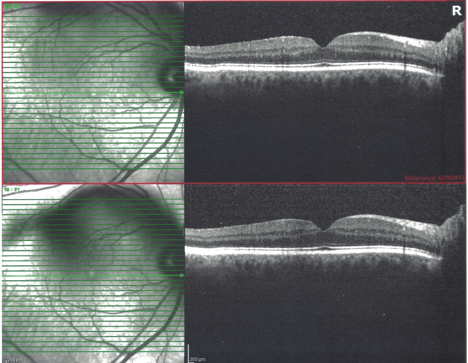 I have the added advantage of showing the retinal scans from today, courtesy of the clinic. As most patients know, experience with getting results like this from clinics is highly variable. Most of that confusion is a direct result of the Privacy Rule that started under the Clinton administration and ended under the Bush administration. It is complicated by CFR42, a federal regulation that directly impacts the release of sensitive data and the way it can be released. after the recent modification to make it clearer and easier to get date, one of the clinics I go to will no longer e-mail me graphical data. That is the outcome I expected when special interest attorneys get involved in health care law. The visit itself went very well. The clinic demonstrated the same efficiency. The retinal exam included scans of both eyes by physical examination of only the affected eye. The scribe was in the room and she picked up an error in the original note and corrected it. The conclusion was no change in retinal opacities (blood in the vitreous) - but well sealed off laser site with resolving retinal edema. In the manner of most proceduralists that I have encountered, it was time for questions. No spontaneous advice. I carefully outlined the physical activities that I am involved in and was advised that I could resume with nor restrictions. I had stopped taking 81 mg of aspirin a day on my own initiative and was advised that I could resume that. The only additional information was follow up in 6 weeks and call if problems. That call if problems is always a tricky proposition. With the retinal opacities from the original tear the large amoeba-like blob over about 1/3 of my visual field was still there, but over the course of the day it comes and goes. At times there are about 20-30 very small black dots floating around in that eye. Given what I know about brain adaptation to let's say prism viewing, I wondered if my brain was adapting to the retinal opacities and only showing me the clear visual field. There were times when it seemed worse, but I concluded that unless it was consistently worse, I should probably not call the clinic. I arrived at that conclusion on my own. but confirmed it with the retinal specialist between now and the next appointment. I also thought about the time it takes me to coach patients about how to self monitor and also warn them about rare side effects. I can spend 10-20 minutes on serotonin syndrome, neuroleptic malignant syndrome, prolonged QTc interval, drug induced liver disease, priapism, metabolic syndrome, and diabetes mellitus. And that is after we have discussed progress and medication side effects. When I thought about the complication rates quoted to me for retinal/vitreous detachments and tears and the success rate of laser surgery - I am telling people about many potential complications that are a thousand to ten thousand times less likely to occur. That is the range I am living in. I am not complaining about it. I think it is much more reasonable to have informed patients who understand that taking a medication is not a walk in the park or a miracle cure. I am concerned that despite my detailed explanations and accompanying literature many people do still not understand it or just ignore it. On the other hand I have had people with known problems like cardiac problems come back and recite everything I told them about potential cardiac problems and what to watch for. The side effect that bothers most people is the potential for weight gain, but most of them can be assured that there is a strategy to deal with that problem. If a medication is effective, people will want to take it even if there are potential problems with it including weight gain and ECG abnormalities. The measurement technology used in ophthalmology is interesting. The human retina is unique enough to allow it to be used for biometric identification. No two retinas are identical and technically even though retinal tears have similar characteristics they are all in a unique biological landscape. Technology clearly differentiates ophthalmology from psychiatry. We remain stuck in the 1960s with an obsessive narrative that classifies but probably does not diagnose. Depending on who you read, phenomenology is there to some degree. Ophthalmologists done't really need to depend on objective descriptions of symptoms - they can see what the problem it. I just read an article on a consensus treatment guideline for depression that adds absolutely nothing to the field beyond what a psychiatrist has learned in residency training in the past 15 years. At the end of the day we have no retinal scan that we can hand a patient and say: "This is your problem and this is what we did to fix it in about 1 hour." I could not fit this into the body of the post anywhere but age-related retinal and vitreous diseases seem like a major oversight in medical education to me. I studied geriatric psychiatry and geriatric medicine and the major focus was on age related causes of blindness that were essentially chronic illnesses. As far as I can tell age-related acute retinal and vitreous problems are a major epidemic and every physicians should know how to diagnose them and how fast they need to be triaged and referred (fast). I am a long time opponent to the expansion of the collaborative care model and have explained why in earlier posts on this blog. At the Minnesota Psychiatric Society (MPS) conference last week, I learned that the collaborative care model had expanded to more than just the treatment of anxiety and depression. The presenter discussed an expanded model to treating bipolar disorders based on questionnaires based screening for that disorder. The overriding rationale for this model is that psychiatrists can't possibly see all of the patients with mental illness, therefore a more hands off approach to care was acceptable. The presenters were very explicit about the model not involving direct patient care in the primary care clinic. The concern is the psychiatrist would start to to develop their own practice in the clinic and within several months their schedule would be full and they would have no capacity to see anyone else. I can say from my experience that a primary care examination room is the wrong setting to do psychiatric consultation. At the minimum a psychiatrist needs a service where they can take detailed notes. Scribes are apparently on the rise these days. I would be be very concerned about the training necessary for a scribe to record the details that I consider to be important and remain in the background during the interview. I am a purist and believe that another person in the room produces a different interview. The argument about expanding the collaborative care model fails at the level of the total number of psychiatrists and the total number of people needing care by psychiatrists. Being medically trained I have always defined those people as having the most severe forms of mental illnesses. That is the essence of having a defined number of physicians for any population and it works very well for other specialties. The ones I have written about here include ophthalmology and orthopedic surgery. Despite having fewer physicians available, both of these specialties cover a much larger spectrum of eye, bone, and joint disease and trauma. They are seeing a larger number of patients and in many cases performing lengthy operative procedures on these patients. The collaborative care model has rapidly evolved in the hands of the APA from the Diamond Project of about a decade ago. The original Diamond Project involved collecting PHQ-9 scores in primary care setting and having case managers remain in touch with patients for supportive counseling and to review the progress of patients based on those scores with psychiatrist. The psychiatrist recommended medication changes in order to improve treatment of the depression and improved PHQ-9 scores. The state of Minnesota took this one step further and decided to implement widespread reporting of PHQ-9 scores from all primary care clinics as part of an accountability initiative called Minnesota Community Measurement. Lacking any scientific or statistical merit did not slow down the politics of the least accountable (politicians) holding the most accountable (physicians ) - even more accountable. At least one group of experts has come out against the idea of depression screening, because using the current models it eventually equates to more antidepressant exposure. That has not slowed down health plans in the state of Minnesota or national organizations that essentially represent health plans. So far, I am unaware of any reporting of PHQ-9 changes. I sent the project an e-mail about 5 years ago pointing out that their statistical approach was meaningless on a longitudinal basis - so it will be interesting to see what they eventually report. The course presented was Applying the Integrated Care Approach: Practical Skills for the Consulting Psychiatrist. It was presented as an official American Psychiatric Association backed course and part of the Transforming Clinical Practice Initiative. Since I have never heard of this initiative before I just assumed it was another in a series of top down decisions by an organization that I thought was supposed to support its members. I would include the very unfavorably rated Maintenance of Certification initiative to be another in that series. I will proceed to the end product to illustrate the general feel of this course for experienced psychiatrists. Every psychiatrist has had on-call experience. During those times it is common to be operating in a decision-making environment where there is either inadequate or partially adequate information to make a decision. An example is being on call and admitting patients by some combination of phone calls or internet network connections or both. A new patient comes in at 10 PM, it is impossible for the psychiatrist to get up and drive to the hospital to do a comprehensive admission evaluation on each patient, so temporary orders are given over the phone, until the staff psychiatrist can see the patient and refine the process in the morning. In the uncomplicated process, this is an easy task. The healthy patient comes in taking fluoxetine 20 mg. The medication is continued until the next day. But things can get much more complicated in a hurry. What happens when you are asked to write the on-call orders for a bulimic patient with depression on bupropion who may be in alcohol and benzodiazepine withdrawal? Or the patient who has been on escitalopram, using methamphetamine, and is complaining of some symptoms of serotonin syndrome? What happens when a sixty year old patient comes in taking 10 different medications for hypertension, diabetes mellitus, and atrial fibrillation? Medications need to be modified or held and significant additional plans need to be implemented. These are the kinds of calls that you will be making in the APAs integrated care model. The only difference is that they will be strictly regarding psychiatric medications, but they will be all of the medications and more than just antidepressants and anxiolytics. You must be prepared to treat bipolar disorder by proxy on partial information and assume the primary care physician has the skill set to take it from there. The screening instrument for bipolar disorder is the CIDI-3 developed by the World Health Organization for lay screening of large populations. I had absolutely no luck in locating CIDI-3 anywhere on the Internet or the WHO website. I was able to locate this Harvard site containing containing what appear to be numerous sections of the Comprehensive International Diagnostic Interview (CIDI). To anyone familiar with structured interviews (DIS, SCID, SADS, etc) it is a the same technology. The CIDI-3 screen described in the PowerPoint for the course had two stem questions - one for euphoria and one for irritability. Neither of them matched my stem questions due to a lack of duration criteria and no rule outs for medical or substance use problems. It is also not clear about how a consulting psychiatrist is going to learn about the pattern of illness from these screens. The it seems that the precedent set by the PHQ-9 and GAD-7, that a positive screening equals diagnosis - also applies in this case. As I thought about all of the work that is involved in the quality treatment of bipolar disorder, I asked myself about whether all of that work and all of the necessary information transfer to the patient and family can be accomplished in a primary care setting. There is also the idea that a medication cures the problem. Although bipolar disorder is undoubtedly one of the most biologically based psychiatric disorders, it takes plenty of skill in managing side effects, associated symptoms (especially anxiety and sleep), and additional supportive psychotherapy. There is also the issue of assessing suicide potential and generally functional capacity including risk for aggression but most importantly the ability to care for oneself. In psychiatric practice - each of those dimensions amounts to an additional primary care visit. All things considered, I don't see bipolar disorder or any type being assessed and managed well in primary care settings with a psychiatrist phoning it in. The lecturer in this case had ample justifications - but to me that is all a reaction to excessive and continued rationing of psychiatric services. And speaking of rationing - the money was discussed. First - the psychiatrist in these consultations does not submit any billing. The primary care clinic submits a collaborative care billing code and then they reimburse the psychiatrist. At no point in my career as a physician employee have I ever seen an exchange like this occur where an administrative fee was not tacked on - just for the purpose of cutting the check I guess. Second - there is all sorts of hype about how these arrangements save money in primary care settings. Since managed care stole the field of medicine 30 years ago - there are ad nauseum articles written about cost-effectiveness. To me it is just another buzz word for managed care. There is no reason to expect that treating severe psychiatric disorders should be any more cost-effective than treating severe non-psychiatric medical disorders - in fact, one often leads to the other. The lecturer in this case was very honest about that. He pointed out the two studies that claimed costs savings and bluntly said that he doubted that would apply to clinical situations. All things considered, collaborative care continues to leave a bitter taste in my mouth. It translates to second class care for psychiatric patients based on managed care rhetoric. The argument can be made that these are not psychiatric patients - but primary care patients who would never see a psychiatrist. I don't know if that is really a legitimate argument or not because it comes down to legal and political convention rather than professionalism. In that case it depends what faction ultimately "wins." The APA has clearly adopted it and it openly promoting it. At the end of this course, there was the doubly ironic offer to enroll in an online collaborative care course that would result in both CME credits and also MOC credits for maintenance of certification. I don't know how covering call suddenly becomes psychiatric innovation. 1: John Kern. Applying the Integrated Care Approach: Practical Skills for the Consulting Psychiatrist. Presented at the 2017 MPS Spring Scientific Meeting; Thursday June 15, 2017 at 1:00-5:00 PM. 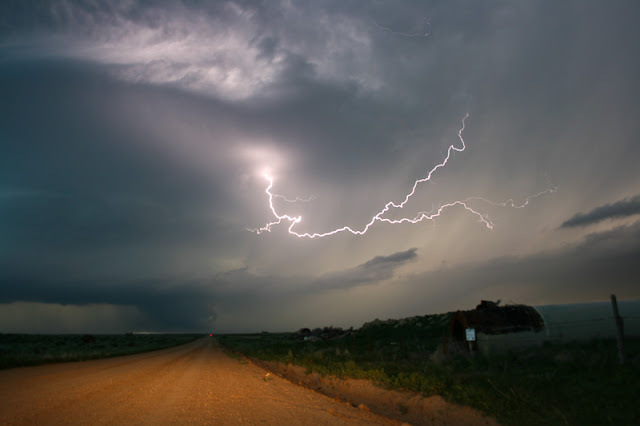 Above image is from National Severe Storms Lab (NSSL) web site and reproduced here per the NOAA intellectual property notice.